Many college students can be found huddled around a bowl of ramen and Netflix between classes. One University of Idaho student is studying how such sedentary habits could affect young people’s heart health. Kathleen “Kate” Connor, 22, is a bachelor’s student studying exercise science and health in the College of Education. Her father earned a doctorate from the UI, and her mother earned a master’s. Originally from Orofino, Idaho, Connor came to the UI expecting to study pre-law. Entering into her second semester, Connor decided to switch tracks when two of her close friends encouraged her to enter into the exercise science and health program. Connor dedicated herself to studying the cardiovascular risk factors associated with sedentary behavior in young adults. Working under the guidance of assistant professor Chantal Vella, as well as graduate students, Connor is working toward finding answers about how young adults who spend most of their time sitting or inactive may face risks of heart disease, high blood pressure and other cardiovascular problems. After her time spent working with her peers and mentors in this field, Connor feels she has found her calling. “These are my people,” she said. 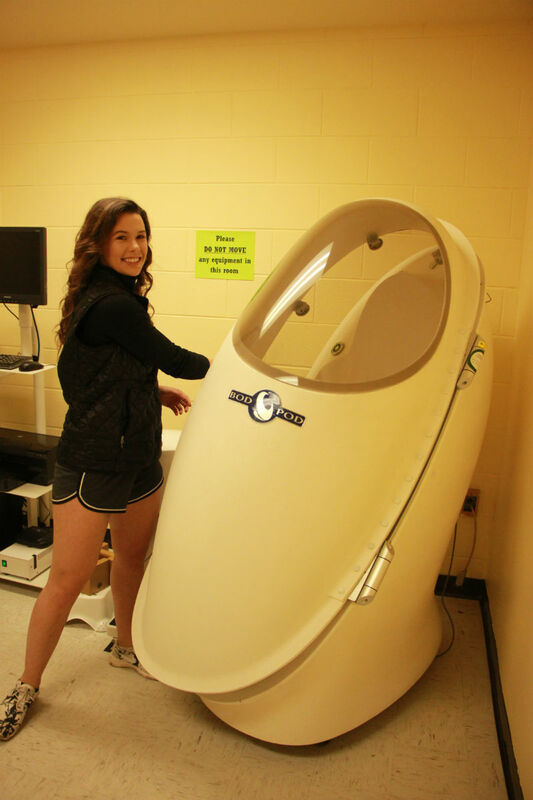 Kate Connor opens the Bod-Pod, which can determine a person’s body composition. The project has given Connor skills beyond her field. Working to­gether and communication are two critical aspects during the study, between both the team and the subjects. “Life is one huge group project,” Connor said. The most important factor in conducting research, Connor said, is the ability to communicate the findings to the public in an effective manner. Connor highly values education, and wants to continue working in the field of exercise science and health, perhaps becoming a professor someday. For now, she plans to get her master’s in exercise science and health, and is strongly considering a doctorate. Kate Connor takes a blood sample from study participant Maddie Faler. WRITER: Emily Good is a freshman from Meridian, Idaho, double majoring in natural resource conservation planning and management and international studies. PHOTOGRAPHER: Yishan Chen is an international student from Kumming, China, majoring in physical education.